Starting October 20, the Metropolitan Opera (Met) in New York City is scheduled to begin eight performances of “The Death of Klinghoffer,” an opera portraying the 1985 murder of Leon Klinghoffer by Palestinian terrorist hijackers aboard an Italian Cruise Ship, the Achille Lauro. In 1985, Klinghoffer, a 69 year old wheelchair bound American Jew, and his wife decided to celebrate their wedding anniversary by taking a cruise on the Achille Lauro. On October 7, 1985 four Palestinian terrorists hijacked the ship off the Egyptian coast. They held the passengers and crew hostage, demanded that the ship sail to Syria, and that Israel release 50 jailed Palestinians. The next day, after Syria refused to let the ship land, the Palestinians singled out Klinghoffer for murder. While sitting in his wheelchair, they shot him in his head and chest and then had some of the ship’s crew throw his body and wheelchair overboard. The ship sailed back to Egypt and the hijackers disembarked. The hijackers then tried to fly to Tunisia, but U.S. President Ronald Reagan ordered a U.S. fighter plane to force the get away plane to land in a Naval Air Station in Italy. The Italian authorities arrested and tried the Palestinian hijackers, but let the leader of the group, Abu Abbas, fly to Yugoslavia. The Syrians found Klinghoffer’s body and returned it to the U.S. for burial. Three months later his wife died. Their two daughters established a foundation to combat terrorism funded by a settlement paid by the PLO to settle the lawsuit brought by the daughters. This lawsuit helped to expedite the passage of the Anti Terrorism Act of 1990, which makes it easier for victims of terrorist acts to sue for damages. Abu Abbas was captured by the U.S. in Iraq in 2003 and died in custody a year later of heart disease. The Achille Lauro. continued to sail until it caught fire off the coast of Somalia in 1994 and sank. “The Death of Klinghoffer,” is an opera based on this hijacking incident. The music was written by John Adams and the English libretto by Alice Goodman. The idea for the opera came from theater director, Peter Sellers, who was a major collaborator, as was the choreographer, Mark Morris. First produced in Brussels and in New York in 1991, it was commissioned by five American and European opera companies and the Brooklyn Academy of Music. The Opera seeks to “understand” the Palestinian hijackers and their motivations, and to see the humanity of the hijackers and of their victims. It romanticizes the terrorists and gives credence to the false narrative that the hijackers were driven to such acts of “resistance” because the Jews “stole” their land and massacred hundreds of Palestinian Arabs in the Sabra and Shatilla refugee camps in Lebanon. Both rationales are false. How can one condone the murder of innocent people in the service of a nationalistic or religious goal? One has to look no further than the recent murders of James Foley and Steven Sotloff to see that credo in action. Would it be fine to produce an opera which extols the humanity of the ISIS members who beheaded the two Americans and explains the ISIS justification for the killings, if it also included the American view of things? Are they really of equal moral standing? Why not compose an opera showing the humanity of Klu Klux Clan members who lynch an African American and their justification for the act? Where is our sense of morality? The Met wouldn’t dare stage either such operas. Why does it feel its OK to stage an Opera spouting anti semitic sentiments? 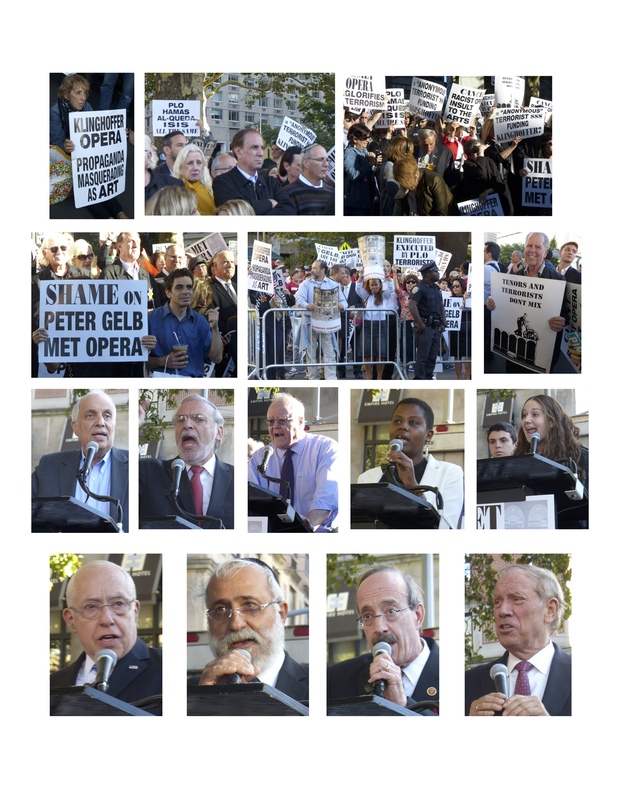 A protest rally was held on Monday, September 22, opposite the Met, to coincide with its season opening. Speakers called for the Met to cancel the Opera, as it is anti semitic and glorifies terrorists. Those speaking included Elliot Engel, a New York City congressman, former U.S. Attorney General Michael Mukasey and former New York State Governor, George Pataki. Victims of terror who survived a bus bombing in Israel, the World Trade Center attack and terror in Africa also spoke. Speakers noted that freedom of speech does not include freedom to spread hate. Those believing the show not to be anti semitic should explain the following words uttered by the hijacker in the Opera,” Wherever poor men are gathered they can find Jews getting fat. You know how to cheat, the simple exploit, the virgin pollute. Where you have exploited, defame those you cheated, and break your own law, with idolatry.” Sound familiar? The German propaganda machine spewed similar sentiments. The Met originally intended to simulcast this Opera on theater screens around the world. However, after receiving many protests that this would spread anti semitism, the Met decided to cancel the simulcast. Does the Met believe that it’s still OK to spread anti semitism in New York? The Met’s general manager, Peter Gelb, said he did not believe the play to be anti semitic, but thought it could be so interpreted. Event organizers also called for the Met to divulge the name of the individual who gave an anonymous multi million dollar donation to the show and promised to return in larger numbers on opening night, October 20, if the show was not cancelled. All terrorists have some rationale for what they are doing. Understanding does not mean excusing. It certainly does not mean glorifying. Terrorism kills innocents. We must not condone it. Remember, a wolf in sheep’s clothing is still a wolf. Anti Semitism disguised as opera and art is still anti semitism. To protest the staging of this work, call 212-870-7457 or write to Gelb at Pgelb@metopera.org. I, like everyone else, am thrilled that the Gaza War has ended. Of course, I am saddened by the loss of life. Israel destroyed much of Hamas’ rocket supply and tunnels and killed some of its senior leaders, but paid a heavy price. The only thing Hamas gained was perhaps the perception that it can stand up to Israel. Of course the price Gaza citizens paid seems totally disproportionate to Hamas’ gain. I admit, however, at being surprised by the recent news reports that Israel appropriated Palestinian West Bank land near Bethlehem to build new settlements. It seemed to me that now was the time to bolster the more “moderate” Palestinians, not antagonize them. A little research put an entirely different spin on this story. The Oslo agreement divided the West Bank into three areas: Area A- under full Palestinian control, Area B -mixed Israeli and Palestinian security control and full Palestinian civil control, and Area C- full Israeli military and civilian control, including the power to zone and plan. The land which Israel now declared as state land to be used for settlements is within Area C. So, in fact, Israel is not taking “Palestinian land,” but rather developing land belonging to Israel. Furthermore, this territory is part of a settlement bloc, south of Jerusalem, known as Gush Etzion. This area was settled by Jews prior to 1948, but lost when it was attacked by Arab forces during the War of Independence. So we see that once again, the media is trying to stir up anti Israel sentiment. Just as the media failed to report that Hamas was shooting from hospitals, apartment buildings, schools, etc, so they failed to report that Israel actually has the right to build in the territory in question. A word to the wise. Anytime a story about Israel’s actions does not seem to make sense, check further. You may well find the facts are different than reported.